Seal tracks on sea ice. Photo by Jason Auch, courtesy Wikimedia Commons. There’s a fascinating paper in PNAS examining the relationship between Arctic sea ice and the single-celled algae that live in sea ice. These tiny players account for 57 percent of the primary productivity—that is, the business of making life from nonlife via photosynthesis—in springtime Arctic waters. Here we … ask instead whether organisms—in particular sea-ice algae—have evolved means to alter ice physical properties to their bene?t, mitigating impacts of climate change. 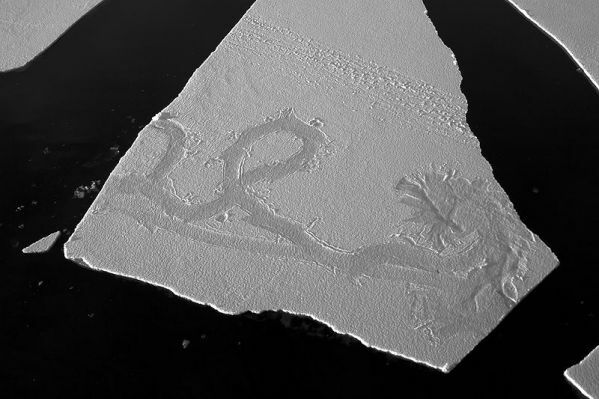 Frazil or grease ice, an early stage in the formation of sea ice. Photo by Mila Zinkova, courtesy Wikimedia Commons. Some background: Although sea ice forms from seawater, it’s composed largely of freshwater. That’s because in the course of freezing most brine is expelled from the ice crystals—though some remains trapped in microscopic channels and pockets known as brine inclusions. 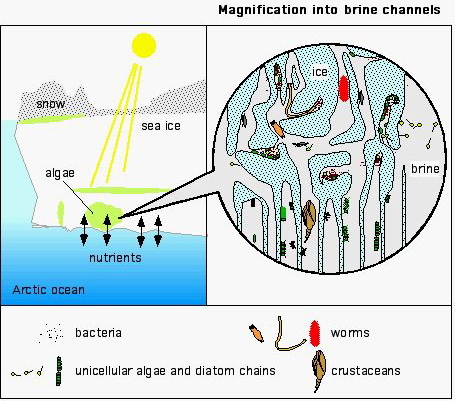 Amazingly, brine inclusions support tiny but rich ecosystems of bacteria, viruses, unicellular algae, diatom chains, worms, and crustaceans—a near-frozen ecosystem inside a frozen world known as a sympagic environment (Greek syn: with; pagos: frost). 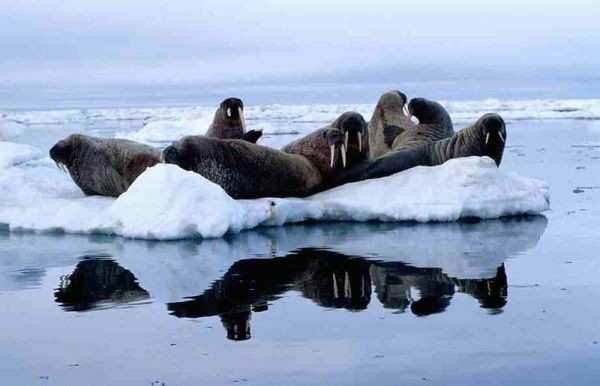 We know a lot of lifeforms inhabit Arctic sea ice—and we hear a fair amount about the big guys, like seals, walruses, and polar bears. Photo by Ansgar Walk, courtesy Wikimedia Commons. The sympagic ecosystem. Credit: Christopher Krembs, Jody Deming, University of Washington, courtesy of NOAA. To survive in brine that’s at or even below the freezing point of seawater, Arctic algae secrete mucuslike glues that function as their antifreeze and antidessicants. Biologists call this goop an extracellular polysaccharide substances, or EPS. The authors wondered what effects EPS might have on sea ice formation or durability. To answer that, they examined natural sea ice and compared it with sea ice they grew in the laboratory—to some of which they added EPS from a culture of the sea-ice diatom, Melosira arctica, one of the Arctic’s dominant diatoms. For controls, they grew lab ice with no added EPS. 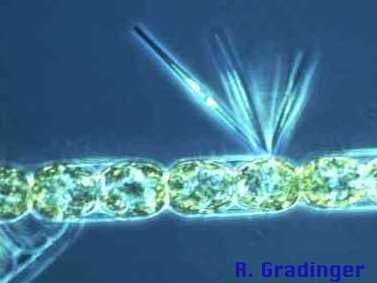 Arctic ice diatoms, Melosira arctica, with ephytic diatoms [the spiky parts]. 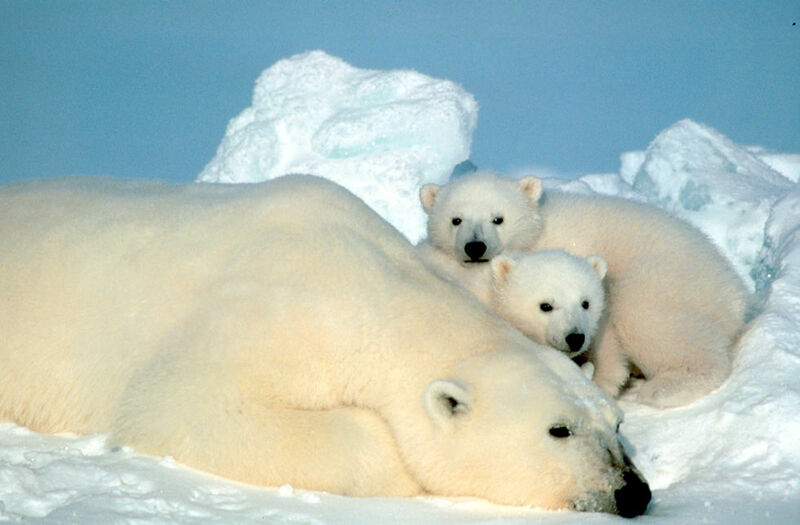 Image courtesy of Arctic Exploration 2002, Rolf Gradinger, NOAA/OER. EPS effects on ice and pore microstructure improve sea ice habitability, survivability, and potential for increased primary productivity, even as they may alter the persistence and biogeochemical imprint of sea ice on the surface ocean in a warming climate. 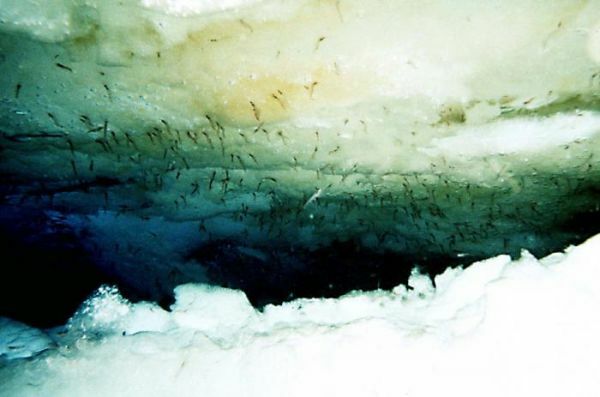 Krill larvae feeding on sea-ice algae in Antarctic waters. Photo courtesy Wikimedia Commons. Sea ice that retains more salt will also retain more of the dissolved constituents of the source water, from carbon dioxide and other greenhouse gases to iron and other nutrients essential to primary production. Their retention, alteration, and eventual release determine the biogeochemical imprint of sea ice on the surface ocean (and atmosphere). 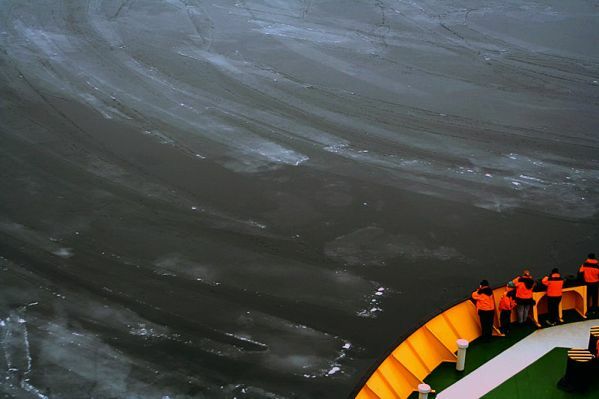 The reduction of ice permeability by EPS must also in?uence the role of sea ice as an inorganic carbon pump from atmosphere to underlying ocean, as well as its seeding and fertilization of surface waters during the melt season. 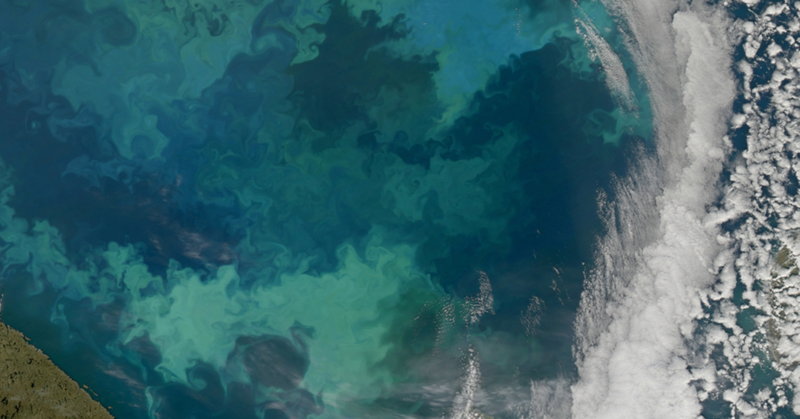 Phytoplankton bloom in the Barents Sea. The bright blue colors are likely from coccolithophores, the green colors from diatoms. NASA image courtesy Norman Kuring, NASA Ocean Color Group. Although this study has provided clear evidence that EPS alter the growing sea-ice matrix, the impacts of EPS on the melting of ice remain to be documented. The mechanical strength of sea ice depends on salinity, with saltier ice, as generated from EPS-rich source waters, being weaker. The persistence of sea ice, however, and its rate of melt re?ect a complexity of factors, including that clogged pores and EPS-coated ice surfaces may retard the advection of warmer saline water and reduce melt rates. Such a potential positive feedback to ice persistence would be of considerable importance to primary production in the ice, its dependent ecosystem, and the ultimate fate of ice in a warming climate. Answering this question requires more investigation, but a potent biological mechanism worth exploring further for its alterations of the physical properties of sea ice has been identi?ed. Photo courtesy the US Fish & Wildlife Service, via Wikimedia Commons.